Looking for a Good Read? Looking for a Good Read? Well here it is! Ever find a book that you just cannot put down, well for me this is that book! 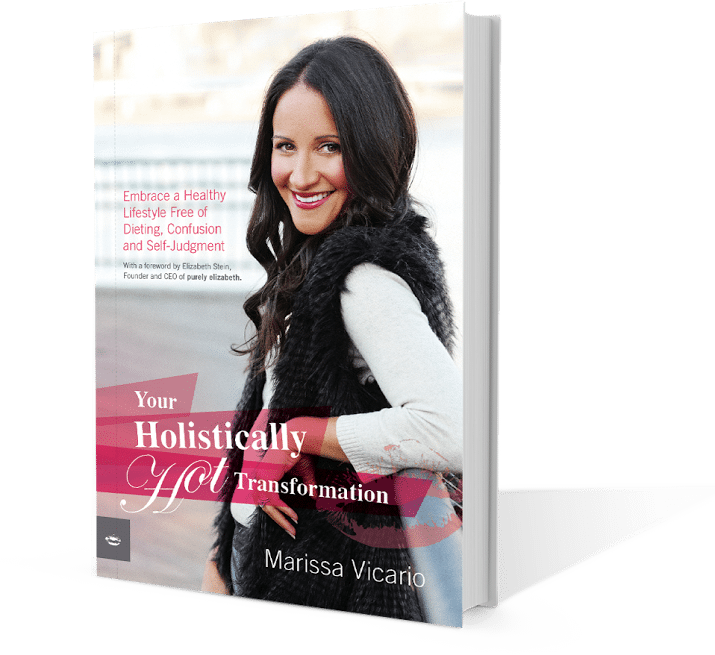 Your Holistically Hot Transformation, by Marissa Vicario. Honest, Easy and Very Thought Provoking. I repeated this several times, and realized that I do this a lot. If I don’t prep my food, or forget to pack a healthy meal when traveling, I think “well I will just resist any temptations”. I cannot tell you how many times I have forgotten to pack a lunch for work and in my large office which vendors bring in not so healthy lunches, and I see a warm bread stick and say, I will just have one and realize I put 3 on my plate. Well I decided to use Marissa book as a tool like she suggests, promotes and provides in her book and see if I could develop some new amazing healthy transformations on my own Holistically Hot Transformation. Best part of the book is the easy steps Marissa provides to help, aid and move towards your own Holistically Hot Transformation. At the end of the book Marissa provides ways to incorporate all of her knowledge into your every day life. Use smaller plates to keep portions smaller, take the stairs instead of the elevator to incorporate exercise into your daily routine when you don’t have time to go to the gym, drink water throughout the day so stay hydrates. But most importantly, Marissa wants you to stop obsessing – don’t focus on the scale, don’t worry about being perfect. Just be you. Be holistically hot! This is a great read for nutrition and health novices because the essentials are broken down in a way that is easy to understand. Your Holistically Hot Transformation includes recipes and a grocery list of food for each food group that should be present on your plate. Whether you’re looking to learn about nutrition and a healthy lifestyle or looking for tips on how to maintain your already healthy lifestyle, Your Holistically Hot Transformation can benefit you. Your Holistically Hot Transformation (Holistic Health and Nutrition) Are you tired of fad diets and all-juice cleanses? Confused about all the conflicting nutrition information available? Over feeling guilty for your nutrition slip-ups? Finally learn to trust yourself to make slimming, nutritious and energizing choices without dieting, confusion and self-judgment! 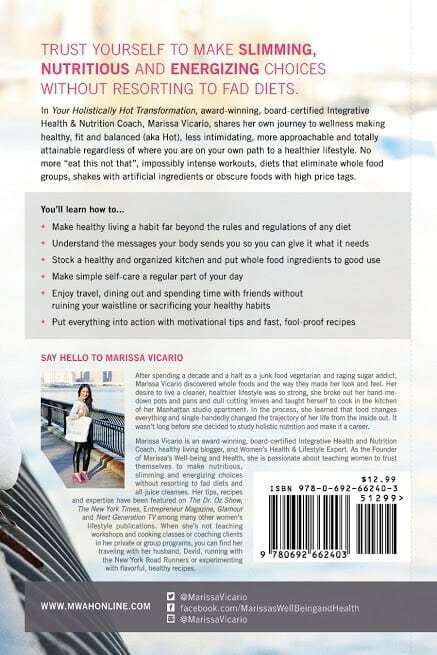 Award-winning Health Coach and Women’s Lifestyle Expert, Marissa Vicario, wasn’t always as healthy and happy as she is today. There was a time when her diet had more macaroni and cheese and G&T’s than broccoli and green smoothies. It wasn’t until she hit rock bottom that she realized something had to change, and it was in that moment that she vowed to make her physical, mental and emotional well –being a top priority. Your Holistically Hot Transformation follows Marissa’s wellness journey from unfulfilled corporate professional to purpose-driven women’s lifestyle aficionado committed to making healthy, fit and balanced (aka Hot), less intimidating, more approachable and totally attainable to women regardless of where they are on their own path to a healthy lifestyle. You’ll find advice for making healthy living a habit, tips for stocking a healthy kitchen, guidelines for understanding the hunger and fullness cues your body sends you, simple ideas for self-care you’ve never tried before and a sprinkling of fast, fool-proof recipes and motivational mantras. Smart, honest, and actionable, Your Holistically Hot Transformation is the most relatable health and nutrition book of its kind. I love all the prep ideas and stocking up tips for keeping healthy foods on hand to succeed. PLUS…you get a great sample shopping list. Health and wellness has become more mainstream in recent years, so there’s a lot of nutrition information available from a multitude of sources, most of it competing. Because I studied nutrition,I can sort through it all, but what about the woman who is just getting started on her nutrition journey? I noticed that when I started working with a client,she was almost always confused and misinformed about how to eat and mindfulness and self-care parts were most often completely missing. I wanted to simplify everything for the woman who is just starting out, confused to the point of paralysis or has tried everything to no avail and wants to start over with a more balanced approached. I remember being that woman at one time, so I wrote the book I would have wanted to read. Sometimes we need someone to reassure us it doesn’t have to be so complicated and that everything is going to be OK.That’s Your Holistically Hot Transformation. Marissa Vicario, AADP, is an award-winning, board-certified Integrative Health and Nutrition Coach, blogger and Women’s Health & Lifestyle Expert. As the Founder of Marissa’s Well-being and Health, she is passionate about teaching women to trust themselves to make nutritious, slimming and energizing choices without resorting to fad diets and all-juice cleanses. 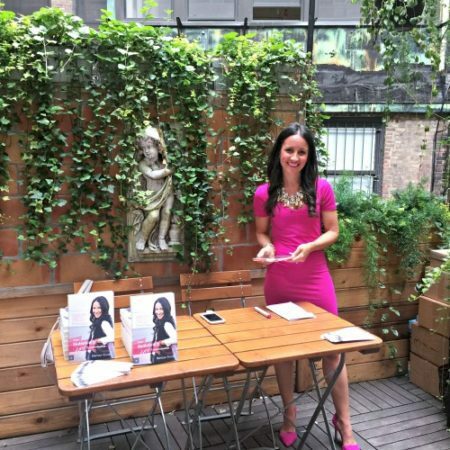 Her tips, recipes and expertise have been featured on The Dr. Oz Show, The New York Times, Entrepreneur Magazine, Glamour and Next Generation TV among many other women’s lifestyle publications. After spending a decade and a half as a junk food vegetarian and raging sugar addict, Marissa Vicario discovered whole foods and the way they made her look and feel. Her desire to live a cleaner, healthier lifestyle was so strong, she broke out her hand-me-down pots and pans and dull cutting knives and taught herself to cook in the tiny kitchen of her Manhattan studio apartment. In the process, she learned that food changes everything and single-handedly transformed the trajectory of her life from the inside out. It wasn’t long before she decided to study holistic nutrition and make it a career. Hope you check it out, it really is packed full of great information. Enjoy. For more Content from Marissa check out her YouTube Channel, here. Summer is here, and so is gardening season. I love to plant annual flowers and keep hanging baskets in my yard for color and all summer enjoyment. With this beauty comes real physical pain. Well, I guess it does not have to be painful, however, I do tend to go overboard and injure myself from time to time. From cuts and bruises to sore muscles and back pain, beauty comes at a price to some. Gardening is a favorite hobby of mine, even if I experience some pain and minor injuries from it. Here is a typical injury from cutting branches and weeding below. I applied Max Arnica on the bruised area with the easy glide on roller and it did provide relief from the pain. I also used on my lower back after a long day of weeding my flower beds and watering my plants. It’s a perfect size to keep on hand and really convenient to use with the roll on applicator. Zim’s Max Arnica Roll-On is a homeopathic topical pain relief product containing arnica and other beneficial homeopathic ingredients with a convenient roll-on applicator. The Zim’s® brand is dedicated to bringing you innovative naturally based products that live up to their brand promise in every way. Our goal is to improve the lives of consumers with our brands that include over 25 products that are packed with the best of nature and range from skin care to pain relief gels. Zim’s® started over 60 years ago with the creation of Zim’s Crack Creme® by a pharmacist in Austintown, Ohio. Today, the Zim’s® brand has expanded to over 25 products ranging from lotions and cremes to pain relief gels and diabetic care items. The Zim’s Max-Freeze® brand provides an affordable topical pain relief gel that emphasizes the use of natural ingredients such as Ilex Flower and Aloe Vera. Zim’s® continues to offer exceptional naturally based products from a small town in Ohio. We look forward to expanding more in the future to provide you with products that utilize the power of natural ingredients to a make a difference in your life and those you love. Zim’s Max Arnica is sold in stores and through online retailers with the 3-oz. Roll-on at a suggested retail price of $9.99. The Zim’s® line offers a number of different over-the-counter solutions for pain relief, skin and lip care. The Zim’s product line aims to expand consumers’ options for quality topical products. To learn more about the Zim’s product line and Perfecta Products Inc., visit http://www.zimsusa.com. Based in North Lima, Ohio, Perfecta Products Inc. is the national manufacturer and distributor of the Zim’s® product line, a dynamic line of naturally based consumer products. The Zim’s product line features different over-the-counter solutions, formulated with naturally based herbal ingredients, for pain relief, skin care, lip care, elder care and first aid. Perfecta Products, Inc. was founded over 60 years ago to help cement workers with their dry, cracked hands and feet with its flagship product, Zim’s Crack Creme. Today, Perfecta Products’ brands can be found in nearly every major retailer in North America. For more information, visit http://www.zimsusa.com. I really recommend this product for use on sensitive skin, I recently had a bout of poison Ivy and my skin was really sensitive after it healed. I applied it several times and loved that it did not irritate or inflame the area. So glad Zim’s asked me to try this product, I now have a new favorite go-to Natural Pain relief topical product rather than the OTC medication.